Our business is our livelihood but it is also so much more. C A G Enterprises LLC was started to fill in a void in the current market and to make a business that the people of Harrodsburg and surrounding areas can place their trust in. Over the years we have never lost our commitment to our clients and that is what has allowed us to succeed in a very competitive industry. We stand committed to our purpose as we stand committed to the people of Harrodsburg and surrounding areas. 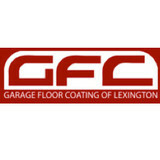 G & G Paving Construction Inc. has been serving the Lexington, KY area and cities like Richmond, Nicholasville, Georgetown, Versailles, Paris and Frankfort since 1986. 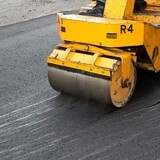 They provide services such as:- Concrete Installation, Concrete Repair, Asphalt Installation, Asphalt Repair, Concrete Cutting, Curbs, Grading, Driveway Paving, Sidewalk Paving, Sub-Divisions, Parking Lot Construction, Striping, Excavation, Seal-Coating, Land Leveling, Site Clearing, Site Preparation. 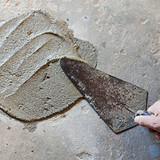 Elite Crete Epoxy floors, stained concrete and exterior decorative concrete installer. 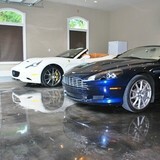 WE ARE AN AUTHORIZED DEALER OF GARAGEFLOORCOATING.COM. WE PRIDE OURSELVES IN USING THE BEST COATINGS AVAILABLE ON THE MARKET! WE SERVE LEXINGTON, GEORGETOWN, WINCHESTER, NICHOLASVILLE, VERSAILLES, PARIS, FRANKFORT AND LAWRENCEBURG. 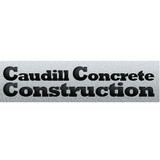 Caudill Concrete Construction is a central Kentucky based concrete construction contractor specializing in stamped and decorative concrete, as well as ordinary concrete construction. Call us for your concrete needs! Our business specializes in custom residential and commercial stonework using local, natural fieldstone, flagstone and more. We build, rebuild, repair, restore, clean, water seal and tuckpoint stone steps, walks, patios, walls, paver walks, cement work and foundations Ed Grady’s interest in stone began during his childhood in Lexington, Kentucky where he was surrounded by old stone walls. There are more rock fences here than any place in the United States. As an apprentice, his exposure to the work of Bluegrass region masons sharpened his appreciation for the use of stone in new designs and honed his skill in restoration. Our work is characterized by strong architectural and functional qualities, suitable for use in both private and public environments. At Amberway Equine Solutions we provide everything for the barn but the barn. We are your online destination for equine supplies for the private facility, large boarding facility and racing operations. Our store is filled with a wide selection of popular brands and essential equine supplies. These supplies include: StableComfort by Promat, Pavesafe Rubber Pavers, Stall Grid, HDPE Fencing, EquiLumination Equine Lighting, Lucas Equine Horse Stalls & Gates, EquiTred Rubber Footing, TravelRight and TravelLight Footing, Cool Barns Fans, Kraft horse Walkers, Treadmills, Therapeutic Solutions, Fly Spray System and other quality equine products. Every single customer is important to us. We work with them from conception to installation. Every project is taken on with extreme care. We love collaborating with our customer, their contractor or architect on the design of their horse barn or arena. Let us lend our expertise to yours. Contact us today for more information! Grant County Concrete Company Inc. was founded in 1958 by Robert Zapp. He created the company with the intention to deliver high-quality ready-mixed concrete to the local builders. Providing excellent service has always been our main goal. Robert’s son, William Zapp took ownership in the early 90’s and the company continues the same commitments to satisfy the customer with the world’s greatest building material, Concrete. In 2001, we expanded our service area to form Gallatin County Ready Mix in an effort to be a full service provider in the Northern Kentucky area. With these two plants and 15 front-end Oshkosh trucks, we can serve even the largest customer, or a homeowner looking to update their residence. We take great pride in serving our community today and look forward to supplying your ready-mix needs in the future. Please contact us today for a quote. T & M Construction, Inc.
From installing new exterior columns to repairing your chimney, masonry contractors can help you add both visual appeal and value to your property. They’ll know what kind of installation makes the most sense for your Lexington, KY climate and regional style. Looking for something that will develop a patina with time? Or would you rather have your home feel brand new for years to come? Choosing the right kind of stone involves thinking about the future, too. Experienced brick suppliers and stone suppliers can help you find the material that will work for your home now and for years to come. These professionals aren’t limited to exterior work either. Whether you want a split-stone granite wall in the kitchen or need help installing traditional brick masonry on your fireplace facade, you’ll want a professional to get it right. If you’re already working with an architect or designer, he or she may be able to suggest a good Lexington, KY subcontractor to help out. Here are some related professionals and vendors to complement the work of stone, pavers & concrete: Landscape Architects & Landscape Designers, Architects & Building Designers, Garden & Landscape Supplies, Driveways & Paving, Siding & Exteriors. Find stone, paver and concrete professionals on Houzz. Search the Houzz Professionals section for Lexington, KY stone, paver and concrete professionals. Browse photos and read reviews, and contact a pro if you like their work.